“His stomach gets so painfully bloated that we can’t even carry him for long to comfort him. Even touching him causes him pain, and he cries all the time. He barely sleeps and struggles to swallow milk. This disease will kill our baby even before he turns one if we don’t get him treated in time. He has only a few weeks left to get a life-saving liver transplant, but now we’re more helpless than ever.” – Kumud, Baby Anurag’s father. Every time Kumud and Lalita take their 7-month-old to the hospital, his painful cries and screams echo through the quiet corridors. All his teary eyes plead for is to be saved from the misery of this deadly disease. Baby Anurag has an end-stage liver disease, and without timely treatment, it will cause severe damage to his other organs and kill him. Even when baby Anurag was born with jaundice, Kumud and Lalita were not too worried. They thought that the yellowness would clear in no time, and he would be fine. 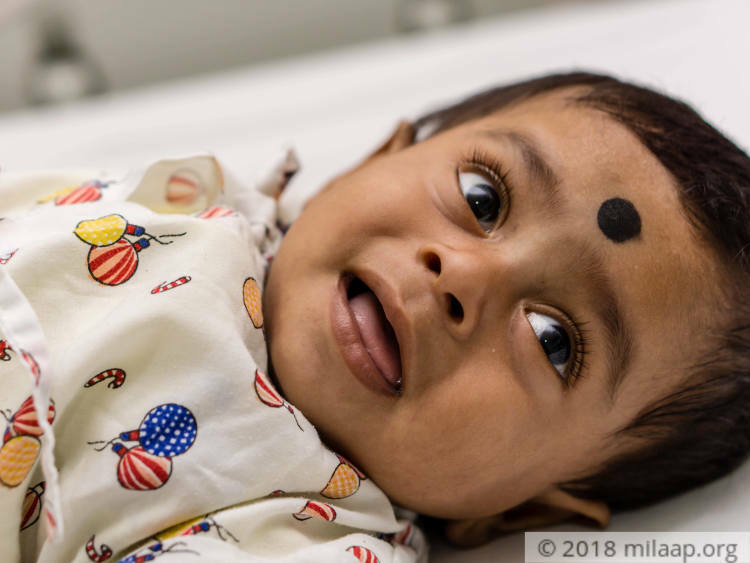 Unfortunately, Anurag’s jaundice was something far more serious - his tests revealed that his liver was completely enlarged. Baby Anurag has Niemann Pick-disease, where excessive fat accumulates in the cells. This first affects the liver and spleen, then causes difficulty in learning and speaking. He now has an end-stage liver disease because of this. Every day, fluid is drained out of his little body to ensure his stomach is not painfully bloated. But this procedure and medicines can only keep him alive for so long, he needs an urgent liver transplant to survive. Kumud, a farmer, and Lalita come from a humble background. Although they didn’t have much, they managed to stay afloat with whatever little income they earned. However, affording their baby’s treatment is far more than they can afford. Even if Kumud toils away all day at the fields, he will never be able to afford 20 lakhs for his son’s liver transplant. They can’t even keep him in the hospital any longer. Kumud and Lalita are hoping that against all odds, they are somehow able to afford their son’s surgery. Kumud and Lalita have already spent 1.5 lakhs on Anurag’s treatment so far after begging and borrowing from family and neighbors. Now, they have nothing left to save their son. 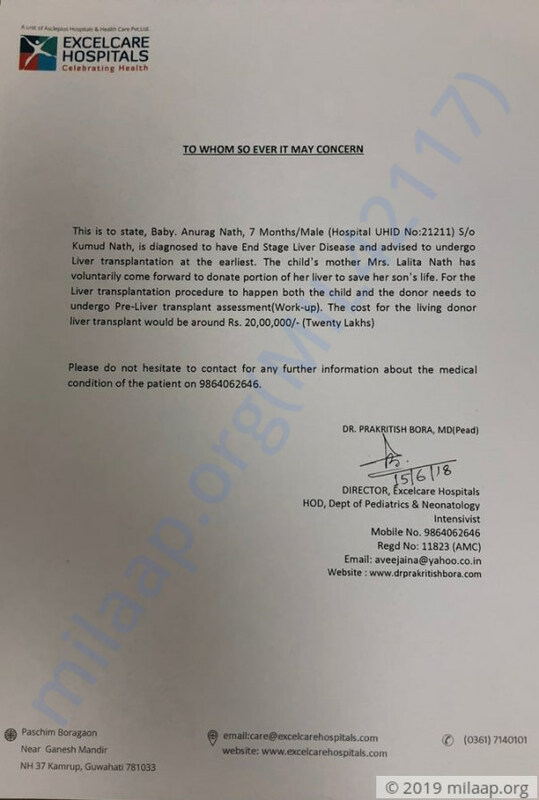 Baby Anurag needs a liver transplant at the earliest to survive and the only thing standing in his way is his parents’ poverty. Only you can help save this 7-month-old’s life. We'd like to thank you for the wonderful support that you have shown towards Anurag Nath. It means a lot to all of us. However, we have some news to share with you today. Anurag needed treatment for End-Stage Liver Disease for survival and the campaign was started to fund the same. However, Anurag's parents do not wish to go ahead with the treatment and had left the hospital against medical advice. 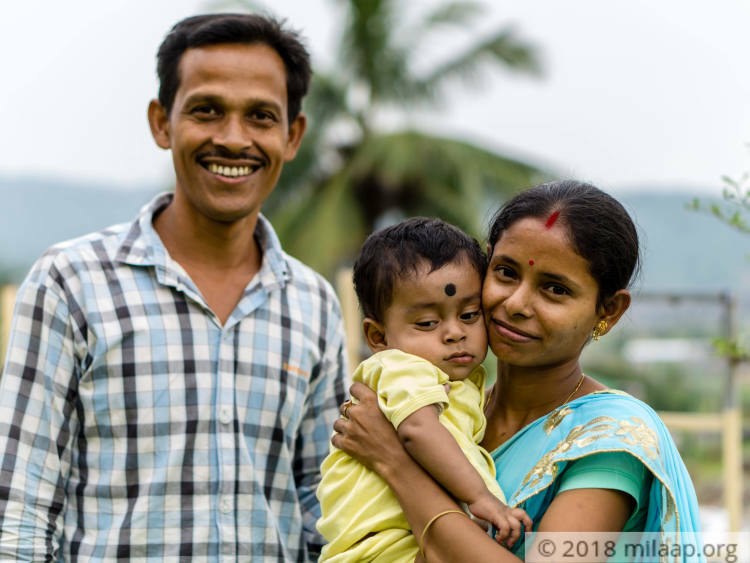 After discussing with the family and their agreement, and doctor's consent funds raised for Anurag would be utilized to help another patient named Gauranga Mali who also has deadly genetic liver disease and is due for the surgery next month. 2. You can opt for a refund for the contribution made and we will be happy to help you with the same. Please reply to this email before the 25th of April, 2019 stating your preference for 1 or 2. After which the funds will automatically be mapped towards Gauranga's campaign. Our prayers and wishes are with Anurag and his family. Thank you again for your support and generosity. Anurag is at home as of now and is on medication. We still haven't found a donor and hence the transplant is getting delayed. We take him for check ups once a month. The doctors say that he must undergo the transplant as soon as possible. I would like to inform you that Anurag is presently at home but his condition has not improved. We are looking for a donor for his bone marrow transplant as no one in the family has the same blood group as his. We are still looking for a prospective donor for the liver transplant, will keep you posted on further developments.